Press photos available at the bottom of this page. The CU Board of Regents has been on a sort of conservative crusade over the last several years, calling for measurements of the political climate on campus, creation of programs centered on conservative thought and hiring faculty to teach conservative thought. Board Chair Sue Sharkey even made the unsavory and uncultivated comparison between being conservative on campus and being gay. Now, with CU President Bruce Benson set to retire next year, the Board of Regents will be tasked with finding his successor. Benson, for the record, was an oil man with no experience in education. He was also the only candidate the Board considered. We need a Board of Regents that prioritizes academic achievement over political agendas, and that casts a reasonably wide net in its search for a qualified candidate for CU’s new president. We believe Lesley Smith has the skills and values to help with that. Lesley spent 30 years as a scientist and educator at CU, and served on the Boulder Valley School Board for eight years. She is currently on the Colorado Science Education Network steering committee. Smith champions online degree programs through the CU system so that people living in rural areas or who have full-time jobs and families can obtain degrees from CU schools without having to come to campus. She supports a CU system wide guaranteed tuition, like the one implemented on the Boulder campus, that locks students into a tuition rate without increases across their college career. She hopes to bring student and faculty pay up to rates equivalent to other PAC 12 schools, an issue she believes is making it difficult for the CU system to attract staff and students. Regents at-largeBoth major-party candidates for an at-large seat on the University of Colorado Board of Regents this year are well qualified for the post. We had the pleasure of interviewing the Republican, Ken Montera, a retired business executive, and the Democrat, Lesley Smith, a scientist and an educator. We wish the Regents did not have a partisan cast. We don’t really see what party politics has to do with oversight of a big and laudable university system. We asked both Montera and Smith about this, and both convinced us that their aims were purely to see CU be the best it can be. However, partisan politics have encroached on the CU Regents as they are now composed. President Donald Trump recently tweeted that he thought Google’s search engine was unfair to conservatives. A majority of the nine regents are conservatives who lately have been concerned that not enough is being done to ensure there are conservative voices and faculty on campus. We get it. We’re just not sure it’s their job. If the regents are going to crusade, we want them to crusade for higher education and access to it. 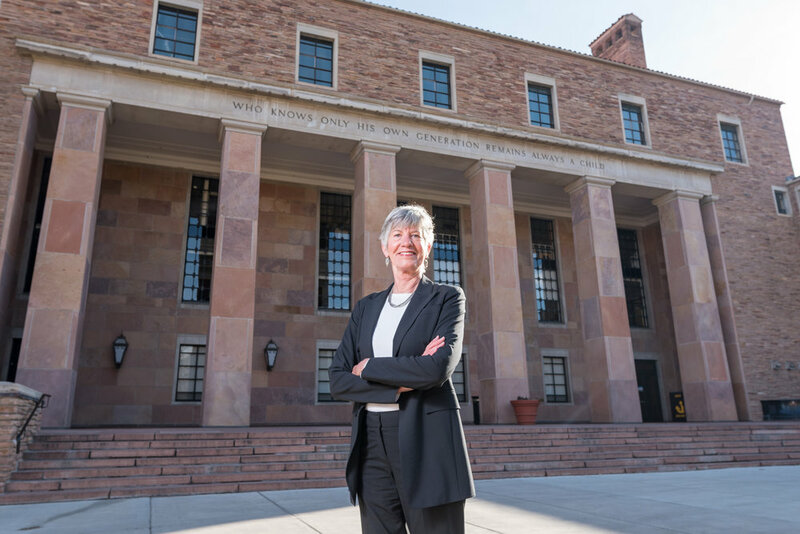 Smith, a longtime Boulder resident, would be the only regent who has faculty experience. She is concerned with ways to make a CU education more affordable, which we think is terribly important. She is a “pragmatic Democrat,” she told us. If the board is truly concerned with diversity, she is just the leavening it needs. 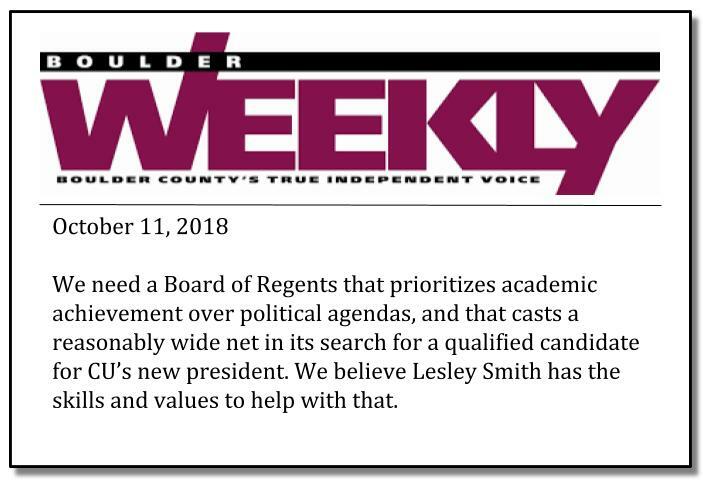 We like Lesley Smith for CU Board of Regents. This scientist and educator has spent her career championing environmental education. Recently retired as the Associate Director of Education and Outreach at CIRES (Cooperative Institute for Research in Environmental Science), local limnologist Lesley Smith remains a devoted advocate of scientific inquiry in the exploration of natural places. Along the way she has been a fierce advocate for conservation of those wild spots. Smith began her work in the research of wetlands, both in the tropics of the Amazon and the alpine areas around Colorado. As an outreach scientist, she made it her goal to share not just the research, but the research process with students and teachers through innovative programs like EarthWorks, which brought teachers from around the country to Colorado in the summer to design, implement and share their own research question. Other programs, such as Lens on Climate Change, challenged students to interview scientists, review data, and create a film that highlights a specific aspect of a changing climate. Lesley Smith is currently running for the office of CU Regent At Large. Thank you, caucus goers. Congratulations county assembly delegates! You have some important decisions to make about which candidates best represent your values and interests. I’m Lesley Smith, an exceptionally qaulified candidate running for University of Colorado regent at large, a statewide race. I’m the only candidate who has had a nearly 30-year career as a scientist and educator at CU, as well as an eight-year tenure on my local school board. I understand the role of the regents, similar to the role of school board — set the vision for our flagship university system, oversee the president, and allocate the budget based on the values of our statewide community. I plan to reach out across our state through local townhalls to learn how CU can best serve your children and your community. I was the first woman aquanaut to live and work in the Aquarius underwater research lab, and I was one of the few women students in my reaearch institution. I have the courage and energy to make CU a beacon among public institutions. I will ensure that CU offers students an excellent, relevant education that equips them with workforce-ready skills. I will work to attract strong funding for a strong CU system, and I will fight for affordable, accessible pathways to success. I have the experience to make a difference in our state. If you see me at assembly, please say hello! I’d love to earn your vote. Please visit my website to learn more about my campaign: LesleyForCU.org. attract strong funding for a strong CU system. with a B.A. in Aquatic Biology. She received her Ph.D. from the University of Maryland after completing a research project in the Brazilian Amazon where she had the responsibility for on-the-ground operations of a multi-million dollar project while pursuing her research. Lesley has lived in Colorado since 1989. She works at CU Boulder's Cooperative Institute for Research in the Environmental Sciences (CIRES) where she worked as a Research Scientist and is currently Associate Director of CIRES Education & Outreach. She lives in Boulder with her spouse Michael, an atmospheric scientist at the National Oceanic and Atmospheric Administration (NOAA.) Together they have two adult children. "I am pleased to endorse Lesley Smith for this November's open statewide seat on the University of Colorado Board of Regents. Lesley is a scientist who understands the necessity of using facts and research to change policy. Lesley would be the only regent with the knowledge of how CU operates from the bottom up. Because of Lesley’s extensive experience, she will “hit the ground running” and provide a unique perspective to the Board of Regents."